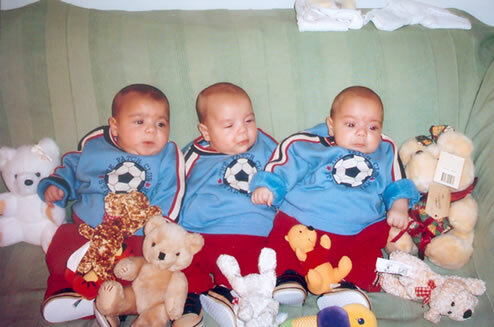 Ben, Dean and Marc Farrugia Born to Etienne and Charmaine on 12th September 2003 at 8:20, 8:22 and 8:24am, weighing 1.9Kg, 1.6Kg and 1.3Kg at 32 +5 weeks gestation. All three needed oxygen for 24 hours but all were OK. Dean suffered an infection at 5 days but all was OK after antibiotics. Ben and Dean were in SCBU for 4 weeks, while Marc was there for 9 weeks. While awaiting to put on the weight to be discharged Marc needed a small percentage of oxygen, this took three weeks for Marc to be weaned off Oxygen. All three were home on 15th November 2003. Miracle can happen to those who believe it.